Got Malic Acid On Your Mind? We all should.... malic acid is an essential for the fibro body! Malic acid and Magnesium work synergistically to address cellular energy deficits, reduce muscle and tendon pain and in the metabolizing of carbohydrates. Yet even the malic acid by itself will help us to increase energy while also reducing pain levels within fibromyalgia..
For optimal benefit when taking both malic acid and magnesium, they are best taken with the B-complex family of vitamins, particularly B-6 (Refer to my supplement page for the best ACTIVATED form of B-Complex). So what are some good ways that we can get more malic acid in our diet ? 1. Malic acid tablets, generally 500mg. 1X per day. Taken with lunch is preferred. 2. 1/4-1/2 tsp. malic acid powder, mixed in juice or water (This bulk powder can be found online or at various health food stores and is very inexpensive) 1X per day or as directed. Magnesium Malate can also be taken if tolerated, but start very slow with dosage. 200 mg. and go from there to tolerance. 3. Ingest more foods that are NATURALLY high in malic acid, such as green apples. If you read my facebook page, you often see me asking the question “Got Granny’s?” Yes, green apples are a great food source of naturally occuring malic acid and I include many recipes on the RECIPE page using green apples and the best way to prepare them. NOTE: Some people have an aversion to eating green apples. Therefore food preparation becomes important. When we shred and blend green apples, they are generally much more palatable. If you are just eating them straight, be sure they are fully ripened, as they do take longer to ripen than other apples. Malic acid is also great for the liver and gallbladder. 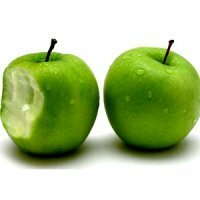 We use green apples in a couple of the liver cleansing recipes on the RECIPE page as well. If you have a history of gallstones or bile duct disease, ingesting malic acid will be good for you in more ways than one as it helps to increase the solubility within the bile. Apple Cider Vinegar is also a source of the malic acid, although not everyone tolerates the 'natural fermentation' in cider vinegar and more would have to be utilized to accomplish the same result. Bottom line, for INCREASE in energy production and DECREASE in muscle and tendon pain and support of our detoxification pathways, malic acid needs to be an essential for EVERY fibro body.